(R.R.P £259.99). Beautiful quality, over-the-knee midi leather skirt in luxury soft lambskin nappa leather, sourced exclusively from British hides. It features a chunky full length silver metal front zip and is styled as a figure-hugging pencil skirt. Fully lined in fine red satin fabric. Length from waist to hem: approximately 27in/68cm. The zip opens fully, fastening from the top downwards – and why not leave it open a little for extra effect and to show the gorgeous lining? Made exclusively for the Tout Ensemble label by Ashwood. NOTE: This same style is also available in other lengths: Extra short mini (12in); Standard Mini (15in); Above-Knee (19in); Knee Length (23in); Mid-Calf Midi (31in); Maxi (36in). Superb quality midi leather skirt in black luxury soft lambskin nappa leather, featuring a full front zip. 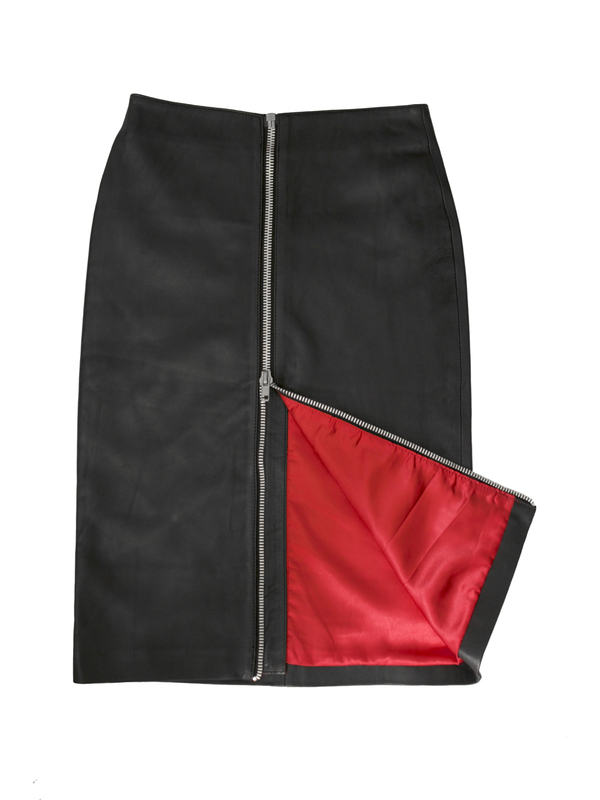 This midi leather skirt is beautifully tailored as a figure-hugging pencil skirt in a below-knee midi length (27in-28in from waist to hem) and is fully lined in a vibrant red satin fabric. Perfect for smart/casual wear. The chunky full length silver metal zip down the front opens fully from the bottom upwards – and of course you can leave it unzipped a little for extra effect and to reveal the beautiful lining. NOTE: This same style is also available in other lengths, from 12in to 36in.